: Board Collector: Dear Mr Systems. Part 2. 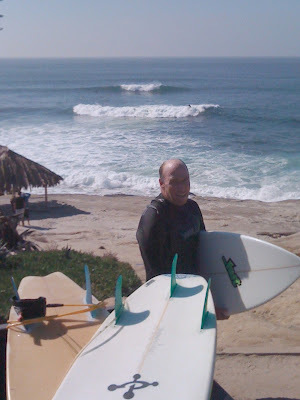 In july 2007 I wrote a post called Dear Mr Systems about my favorite twin fin and how I couldnt keep a fin in it. The story goes, after breaking off and losing the original fin on rocks I decided to put in FCS plugs so I could travel more easily with my most trust worthy board. After losing a number of sets of FCS twin fins I wrote an angry blog from Sydney that was very kindly and promptly responded to, on the other side of the world, by Tyler Callaway, Director of Business Development Surf Hardware International in San Diego. As if to prove how small the world really is, I was surfing this very same board from Australia at the the world famous Wind 'n' Sea in San Diego yesterday and who should I met in the water- Tyler Callaway!